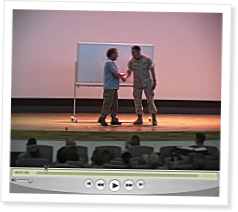 On April 22, 2009, Coach Glassman gave a presentation to the Officers and Staff Non-Commissioned Officers of the 3d Marine Division in Okinawa, Japan. Major General Robert Neller extended the invitation to increase the unit leaders’ knowledge of fitness, injury mitigation, and overall combat preparedness. In part 1, Coach Glassman begins by speaking of his early influences. His father is an engineer who once made him precisely measure the length of 1,000 nails and plot the results. The lesson learned? Properly defining terms, careful observation, measurement, prediction and experimentation can reveal truths previously undiscovered. The CrossFit story started with a belief in fitness. There is an acquired capacity that lends itself generally well to any and all activities. A person is as fit as they are balanced in 10 general physical skills. The specialty of CrossFit is not specializing. The goal is to prepare for the unknown and unknowable. All physiological adaptations are important. None should be neglected. By this definition, he or she who performs best on average on the skills and drills common to all sports is most fit. In part 2, Coach Glassman discusses the desirability of balance among all metabolic pathways. The performances of athletes who can clean and jerk three times body weight or win an Ironman competition suggest imbalance. CrossFit has looked at human movement and resolved it to its fundamental physical units of force, distance and time. Power output can be measured across broad time and modal domains. In part 3, the question and answer session begins. After speaking of early encounters with Pukie and stealing unicycles, Coach Glassman discusses programming, implementation, and how to run PT as sport. In part 4, Coach Glassman discusses the importance of mastering basic mechanics and the balance between safety, efficiency and efficacy. The Colorado State Patrol has now been using CrossFit for five years without a single injury and has just incorporated some CrossFit workouts into its fitness testing. In part 5, Coach Glassman says that every civilian contractor for physical training throughout the Department of Defense should be fired. Service members have to figure things out for themselves. He discusses some of the challenges that have been encountered in implementing CrossFit in the Marine Corps. Jimi Letchford, Director of Operation Phoenix, provided an update on how CrossFit is being used at the School of Infantry and elsewhere in the Corps. Phenomenal, Coach! PT scores up 30%, Injuries to 0, and the outfits wanting more! I don't know if its my computer, but part 4 seemed to be unreadable for the quicktime .mov file ... tried downloading it twice. Somehow the idea of firebreathing, crossfitting Marines makes me feel warm inside ;-). Huurrahh! 3rd times a charm ... downloaded part 4 & watched successfully. Thanks. Great lecture. Unfortunate to hear about Operation Phoenix. Will there be an audio version available? Thank you. Good suggestion Patrick. Now it's available. Wow!! I've seen coach's lectures many times, but they never get old and I learn someting new every time. Great lecture! Always picking up new tidbits every time I watch coach's presentation. Operation Phoenix........unbelieveable........Why is it that most things that will help the soldiers catches crap or gets completely shut down? Better equipment, better physical programs, etc........Should we not be putting out an effort to to give the best care for those that put their lives up for our country? Nobody forced them to join and put their lives on the line for millions of people that will never know them......The LEAST we can do is provide sufficient programs to increase their rate of survival and doing a better job. Is that really so much to ask? i have been involved with crossfit for a long time now and i will tell you that coach g motivates the hell out of me! hearing him speak on the basis and foundations of fitness is educational and absolutely a breath of fresh air. not only that he is educating our military, our firefighters, our police and our society how to survive! gotta just love the hell out of this stuff. Kudos to Gen Neller for getting Coach out there to speak to the Marines about CrossFit Training (CFT). What a fantastic, detailed presentation to have available as a resource. Thanks for loading that all up to the Journal. That series ought to be available for TECOM, the training arm of the Corps, to view and consider for program evaluation. The high level support Gen Neller provides is what the Marine Corps needs to get this implemented and imbued in the Marine Corps ethos. It took many years to get rolling, but the Marines implemented a Martial Arts program. However, as good as it is, there have been numerous injuries in that program. I saw one LtCol practicing for his first belt break a collar bone requiring screws to repair and putting him out of commission for quite some time. On the other hand, CrossFit is able to show low to nil injuries and they are worried about implimenting CFT. I say look at the Martial arts program and compare the injuries there against the implementation at the recruit training. Maybe the CFT will even reduce injuries that are occcuring in the Martial Arts program, too. That would be based on the modality of learned skills and improvements gain through CFT. At CrossFit Quantico, there have been incredible results for both Marines and civilians, thanks to the volunteer efforts of Maj Drew Thompson and the cadre of volunteer coachs he trained and established here before moving on to his next duty station. What a shame about Op Phoenix. No good dead goes unpunished, eh? Just to pick a nit about one small comment in the talk. Doing a muscle-up over a vertical obstacle like a wall is the worst way to get over if you have people trying to shoot you. You're going to look like a popup range target as you silhouette yourself at the top. The rule is whatever sticks up gets shot off and if that's your head then...you get the picture. The correct way is to slide over on your stomach. That's the way it's taught in school. You stay as low as possible - and it's still very dangerous, of course. Your buddy is the one who observes. This in no way diminishes the usefulness and utility of the muscle-up as a functional movement - just in this case it is not tactically sound. A great lecture piece. I arrived in Okinawa shortly after this lecture, and therefore I am bummed that I couldn't attend myself. I always learn when listening to coach explain the methodology and thought processes behind CrossFit, not to mention discovering once again that he is not a heartless monster who picks workouts cause someone told him I was bad at this or that!!! I will make one overall recommendation with regards to these large venue lecture clips (i.e. war college, 3d MarDiv, etc.) For the Q&A perhaps either repeating the question that is asked (since the individual asking is not on the mic) or having someone transcribe the question (more than just the jist of it like in the War College lecture) onto the screen. I can usually back out what the question was by listening to the answer, but hearing or reading it would help. Otherwise, this was yet another great piece and I can say, as a Marine myself, I am more confident in my ability and the ability of every other servicemember who does CrossFit to defend our country and come home alive than anyone who does any other standard gym routine. Period. Listening to Coach speak is always a learning experience. He brings up several questions about fitness that most people never consider. For example, towards the end of part two he raises a simple but interesting question; Does learning better technique, which in turn gives you better results, make you stronger? After some elaboration he says that it does. In my opinion, the mental growth is the most overlooked aspect by Crossfit beginners. Yes, you will see physical gains; you will run faster, jump higher and pick up more weight then you did before. More so, you will be more mentally tough then you have ever been before. OPT, in Every Second Counts, said it best, "You get comfortable with being uncomfortable". Think of the first time you had to mentally face fight gone bad. I remember the first round ending and thinking that there was no way I could keep going. I had this uncomfortable feeling and had to learn to fight through it. This type of mental strength exceeds the boundaries of fitness. It can help you deal with a variety of situations. My girlfriend is starting Med School in January and, when asked how she should prepare, I said Crossfit. She has proven, through her under graduate work and test scores, that she has the educational fundamentals to be a doctor. However, med school students are tested on their ability to perform well under pressure, and in allocated time. They are forced to go through tough mental situations to prepare themselves to possibly make life and death choices in the future. Basically, they have to learn to be comfortable with being uncomfortable. It would also be helpful to tag comments to certain time in the video or audio. Hulu just integrated this feature but I am seeing it more online from other sites as well. It is a unique and user friendly way to browse comments. A great lecture, thanks for sharing this wonderful methodology. Can we get Coach on TED, already? That news on Operation Phoenix makes me sick to my stomache. The corruption we experience every day stinks to high heaven and beyond. I hope when the time is right Coach does go public with it, completely reduces whatever organization is hurting Operation Phoenix to rubble, and lets the world know about it too. Other than that, great lecture. Ever since I found CrossFit in 2004, I have been intrigued with it. I attended my CF Cert at the original Santa Cruz location, where you did a masterful job of teaching us. Now things you're doing like this just make the CF experience all the better! I just learned more in the past hour then I think I have ever heard from people trying to explain to me fitness. I can't believe I've never heard these things before. Amazing! This is why I love the Crossfit Journal. Appreciate it coach.